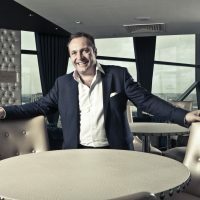 Nick Taplin is Chairman and CEO of Black and White Hospitality and master franchisor to Marco Pierre White. With over 30 years’ experience in the hospitality sector, Nick has managed and developed venues and properties across the whole hospitality spectrum from nightclubs, five-star hotels, branded high-street bars, branded hotels, health clubs and spas. Prior to Black & White, he was managing director of Sanguine Hospitality, which employed over 900 people and had a portfolio of properties worth over £200million, where he was responsible for developing and managing branded hotels and luxury health clubs and spas. He is also owner of a four-star, boutique-style hotel in the South West of England called Cadbury House which he bought back in 2003. Ploughing over £30 million into the venue’s redevelopment it was here that Nick’s relationship with Marco Pierre White was born. With seven brands, Nick’s role is now focused on driving Black and White Hospitality’s expansion which is fast approaching its 50th UK-based venue. The brands include Marco Pierre White Steakhouse Bar & Grill, Marco’s New York Italian, Mr White’s English Chophouse, Wheeler’s of St James’s Oyster Bar & Grill, Bardolino Pizzeria Bellini & Espresso Bar, Koffmann & Mr White’s and Marconi Coffee and Juice Bar. The business has also opened its first two international restaurants in Abu Dhabi following the launch of Black and White International with plans to open more venues already in the pipeline.